• Authors: Mathew Smith et al. 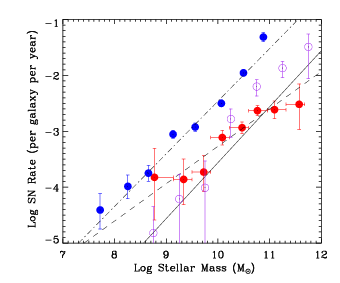 This figure shows the Type Ia SNe rate as a function of host galaxy mass. Passive galaxies are shown in red and star-forming galaxies are shown in blue. The data points from Sullivan et al. (2006) are shown as open circles. From this, one can see that the Type Ia SN rate as a function of host galaxy mass follows a different trend for passive and star-forming galaxies. A Type Ia Supernova (SN) marks the thermonuclear ignition and explosion of a carbon-oxygen white dwarf which has exceeded the Chandrasekhar Mass. Beyond the Chandrasekhar Mass (about 1.4 M☉) a white dwarf can no longer support itself through electron degeneracy pressure, so when it exceeds this limit it begins to collapse. As it collapses it will reach temperatures and densities high enough to ignite carbon. These nuclear reactions occur quickly, so quickly that the energy they release disrupts the entire star in a supernova explosion. Because this is the basic mechanism by which all Type Ia supernovae occur, each explosion is essentially the same brightness. This has made them ideal distance probes, or standard candles, which have been used to measure the acceleration of the expansion of the Universe in the standard cosmological model. This all sounds great, but in reality, Type Ia SNe might not be as standard as we hope. The scenario by which these objects accrete material and explode is uncertain. A white dwarf may accrete material from a main sequence or red giant star companion. Another scenario involves the merger of two white dwarfs. These systems form on different timescales, so one way to distinguish between the two scenarios is to measure the delay time between when the system is formed and when a type Ia SN occurs in a variety of galaxies (see also Nathan’s post). Some previous work has suggested that there is actually a two-component Type Ia SN rate, a prompt component which is dependent on the star formation history of a galaxy, and a delayed component which is dependent on the mass of a galaxy. Two different rates imply two different progenitor systems, making the assumption that all type Ia SNe are the same brightness problematic. 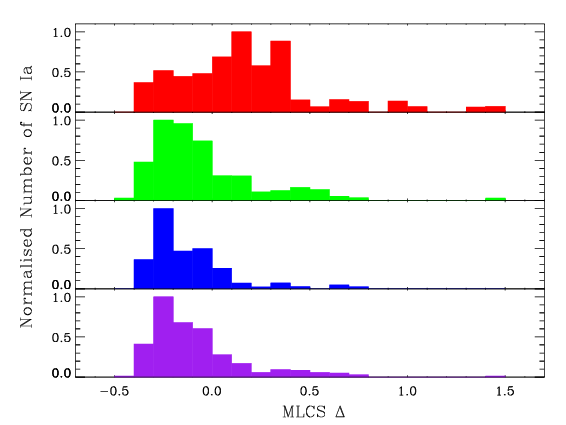 This figure shows that the distribution of Δ for Type Ia SNe differs for passive galaxies (top panel) and star-forming galaxies (bottom panel). The bottom panel is further divided into moderately star-forming (panel 2) and highly star-forming (panel 3) galaxies in order to show that the Δ parameter distribution is not a function of star-forming rate, but rather an intrinsic distribution found in all star-forming galaxies. The authors in this paper examine the Type Ia SNe rate in various galaxies using the Sloan Digital Sky Survey-II Supernova Survey. This survey provides a large sample of supernovae which take place in galaxies of various masses and star formation histories. The authors affirm that the Type Ia SN rate follows a different trend in passive galaxies (those with no recent star formation) and star forming galaxies. Furthermore, they confirm that the observable properties of Type Ia SNe may be different in passive and star forming galaxies. Specifically, they examine the Δ parameter, which quantifies the relationship between an explosion peak brightness and the rate at which the light curve declines. They then use this relationship to examine the likelihood that Type Ia SN observed in passive and star-forming galaxies arise from the same progenitor population using both a Kolmogorv-Smirnov (KS) test and an Anderson-Darline (AD) test and find that they are very likely to arise from different populations. The results of this paper affirm previous suspicions that the Type Ia SN population is not homogeneous. This confirms that a better understanding of the explosion mechanism and properties of Type Ia SNe is needed before cosmological models can be further constrained. Supernova are rare, so rare that the last one that occurred in the Milky Way happened in 1604. That makes the news that the Palomar Transient Factory discovered a nearby Type Ia supernova in the Pinwheel Galaxy (M101) very exciting. At a distance of only 21 million light years, this is one of the closest supernovae seen in decades! Because of its proximity, astronomers will be able to study this event in unprecedented detail, hopefully leading to new clues about the details of these explosions.